Saving, recycling, and reusing what others just throw away. Because aren't the landfills full by now? And who wants all their stuff to look like everyone else's stuff? I've been completely preoccupied by having my house painted, both by hired contractors and by myself. I got so obsessed with it that I've decided not to work on the house at all this week (the contractors finally finished their part) and to try from here on out to limit myself to three hours of house labor per day. Hopefully all this will make it possible for me to get back to blogging more regularly. Anyway, I was up in New Hampshire this past weekend, helping to organize a big family yard sale. At the yard sale, I ran into a woman I've known for years but who I recently learned is interested in mushroom hunting. 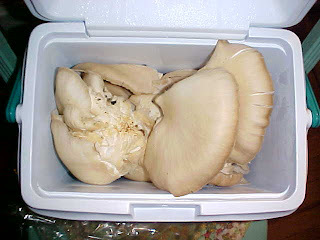 We chatted and she told me that Oyster Mushrooms can be found on dead or dying maple trees. 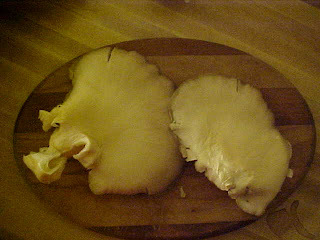 As I was driving home yesterday, about 1/2 an hour from my family home, I drove by two large decaying maples with Oyster mushrooms running up it in straight lines, from 2 to 20 feet off the ground. I promptly turned around, parked in front of the house with the maples and knocked on the door. 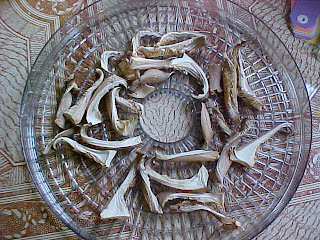 Before I could even finish asking if I could take the mushrooms, the woman at the door said "help yourself". (This gave me even more confidence that these mushrooms were Oysters, because it was clear that I wasn't the first person who had asked to take the mushrooms.) I didn't take all of them (being without a ladder, for one thing), but I did end up with several pounds of beautiful mushrooms. 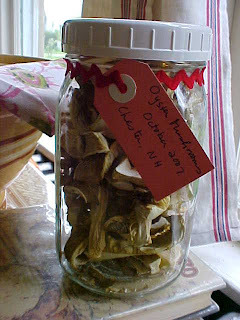 When I got home, I gave some to my neighbors who have taken me mushroom hunting before. I sauteed some up with butter and onions and ate them with some local potatoes - they were absolutely delicious! 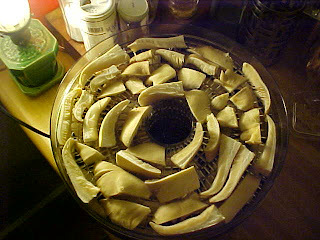 Then, overwhelmed with how many I had and perplexed by how best to preserve them, I called my friend Frank who has a food dehydrator. I took him a big bag of the mushrooms and got the dehydrator in exchange. 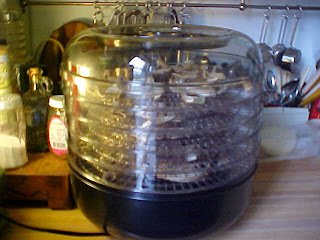 Here is what the mushrooms look like: And here is the small cooler I filled: I sliced them up and filled the trays of the dehydrator: they really shrink up when they dry out: I ended up with more than two quart jars of lovely dried mushrooms: We are entering into serious mushroom season around here, where we've had rain and cool weather. I'm really looking forward to harvesting more of what the earth offers up. I love the efficiency of feeding myself with nothing more than the labor it takes to harvest the mushrooms and apples I can find. Hopefully I'll also find the time to pick some wild grapes and make jelly! I went to a big lunch at the small liberal arts college where I taught until recently. The theme of the lunch, served outside under tents, was local food brought in by local farmers. Every ingredient, other than the salt, was locally procured. The farmers brought in tons, and I do mean tons, of various squash that were used to decorate the grounds and, I suppose, illustrate the bounty of our local farms. People were allowed to take squash home, and here is what I carried back to my car: While we were eating, my friend Katheryn commented on the tendency to eat to excess at buffets, and wondered why we do this. We all agreed on the general explanation that we are disposed to eat, and keep on eating, whenever we find ourselves in situations of bounty, as a disposition, perhaps even genetic, left over from our hunter-gatherer past, when such a dispositon would be crucial to survival. Eat when there is lots of food available, and you are more likely to survive the periods when there isn't enough. If that explanation is right, and does explain our tendency to gorge ourselves when surrounded by piles of free, ready-to-eat food, then I think that it may also extend to my disposition to take as much free stuff as I can fit into my hatch back when I'm surrounded by free, good stuff! 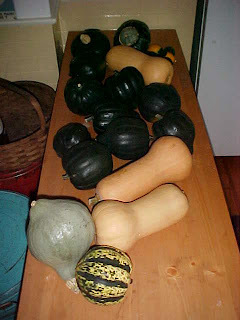 After I got all this squash home, I regretted that I hadn't gone back for more.... I wish I had more of the butternuts, and the carnevales, which you see in front, especially since squash stores well. 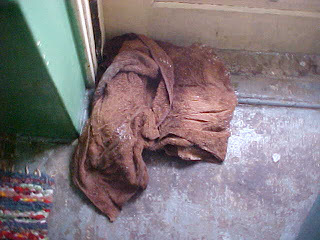 Now I've got a nice store of squash in a basket in my basement, covered with one of these towels. Fall is the time to put food up for the winter, and I'm doing my part. 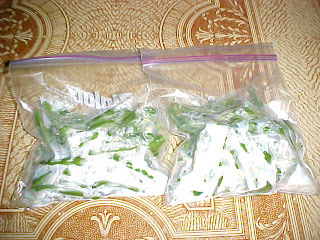 My neighbors, Sam and Marcia, are good scavengers, and yesterday they brought me these green beans, gleaned from some farm up in Poland, NY, which had been a bit mangled by the harvesting machine: I washed them off, cut off the damaged parts of the bigger beans, blanched and froze them. 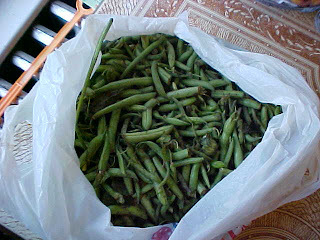 Here's what I ended up with: I'm glad for the beans, and glad to have kept them from going to waste. My friend Frank recently told me about this company: Terracycle. These guys are making plant food by feeding organic waste to worms and then packaging these gardening products in old soda bottles, which would otherwise enter the waste stream. Pretty clever. Of course what we really need to do is to produce far fewer of these plastic bottles in the first place - reusing just isn't enough of an answer to our waste problems. I also would like to know how much fossil fuels these guys are using to make their products. But in any case, there is some clever thinking going on here. I took some pictures for this blog while travelling in England and Scandanavia this summer, but did very little blogging from there, so I have a little catching up to do. I saw this clever reuse of plastic shopping bags (what the Brits call "carrier bags") one evening while killing a little time before I went to see a play at the Old Red Lion pub, near the Angel tube station. (Pub theater is great. This place was a nice pub downstairs, with a tiny, tiny theater upstairs. You buy your ticket, get a pint, and when the bell rings to let you know to go upstairs, you bring your pint along. I didn't love the play, but I did enjoy the overall theater experience.) 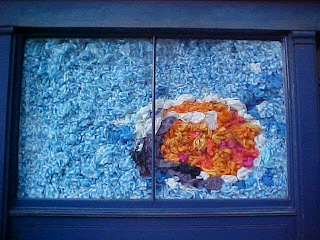 So, an empty storefront window had been artfully filled with crumpled plastic bags, affording privacy to whatever was going on behind the window, I suppose. Of course it's too bad that there are so many plastic bags in the world to begin with, but I liked this clever repurposing of them. 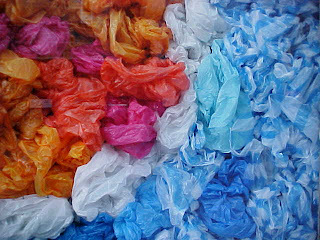 There are some movements afoot to ban plastic bags, such as this one in San Francisco. Here is another story about the international movement to get rid of them. I'm all for such bans. Here is another site to get you acquainted with the issue. 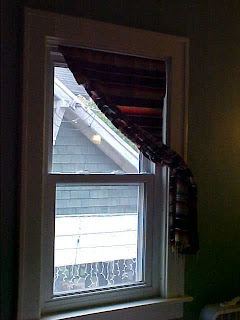 Well, it's coming up on two years since I bought my house, and I'm finally getting around to putting up curtains. (Mr. 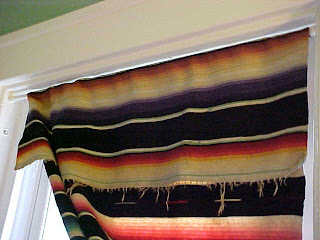 Happy says that being at my house is like hanging out in a fish bowl...) The first project (first because it was easiest) was to put up a curtain on the one smallish window in my guest room, site-of-my-future-sewing-room. I was rummaging through my not unimpressive fabric collection when I came across a pile of nice old Indian-style woven blankets (all acquired for a mere $5 at an auction a few years ago). And one was just the right size for the window. It doesn't look great when it is down (meaning providing privacy), but I like how it looks swagged, which is how it will be the vast majority of the time. I couldn't get a good shot of the whole window, but here are some pictures that give a good idea of how this little project worked out. 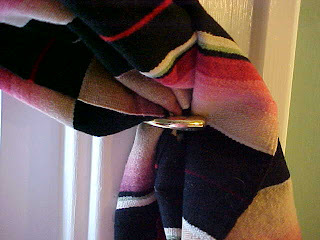 It couldn't have been easier: I folded it across the top and put in a seam to create a pocket for the tension curtain rod, then put a simple brass hook to one side for swagging. 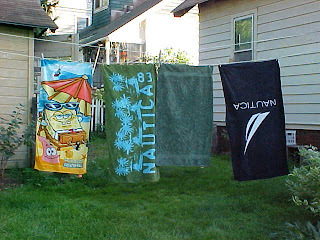 What Do Towels and Scissors Have In Common? One man's trash is another woman's treasure. A not-too-badly broken bench, that my friend Cathy helped me carry back to my Hoboken apartment from a nearby sidewalk. I repaired and painted it and used it for years, then I put it in the barn in NH, where my brother found it, took it home and used it on his sunporch for years. Then he put it back in the barn, where we refound it, painted it a new color and are now using it as porch furniture in Nottingham. How's that for getting a lot of use out of a broken thing someone else threw away??? A set of four heavy, nicely made maple captain's chairs, which I took to NH, where they got a coat of oil based paint and are now terrific porch chairs - found in the trash in Clinton, NY. A chrome cup holder found in the Swap Shop at the Nottingham, NH dump, oops, I mean 'recycling center'. A matching pair of glass (!) candlestick lamps I pulled out of the metal dumpster at the Nottingham dump years ago. A very nice wood-framed mirror that had been painted but with minimum effort I refinished - found in a trash pile in front of a house in Clinton, NY. A chrome towel rack in a rubbish pile in front of a house on Williams Street in Clinton, NY. A pair of small vintage floral curtains that I sold on Ebay for $40 - found in the trash in an alley in Oxford, Ohio. A small antique Sarouk Persian rug, appraised to be worth $400 - found by my father in the trash in a rich Newton, Mass neighborhood.